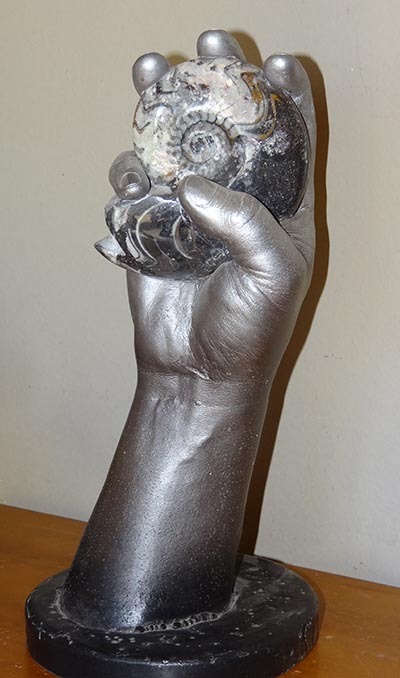 Hand casting holding an object can unlock new creative ideas for you. 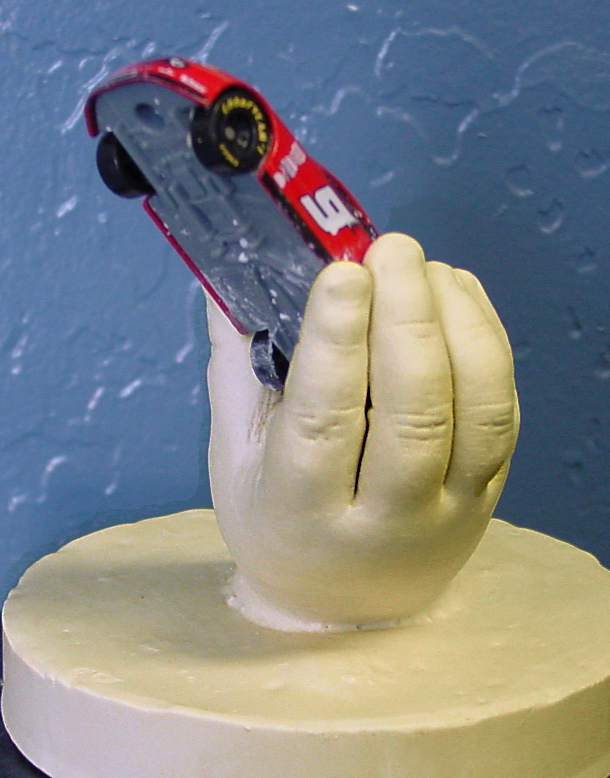 Hand casting is limited only by your imagination. If you can see it, you can most likely do it. Babies, children, adults and families are very common. Less common are hand castings actually holding an object of some kind. If the object is something precious or important to the model, the casting can take on a meaning other than just a hand. 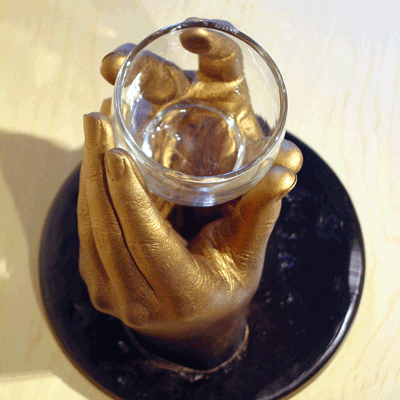 If the object is something utilitarian, the hand casting can actually become useful. I've been lifecasting for about 30 years now and this blog post offers all the information on this topic I can think of. 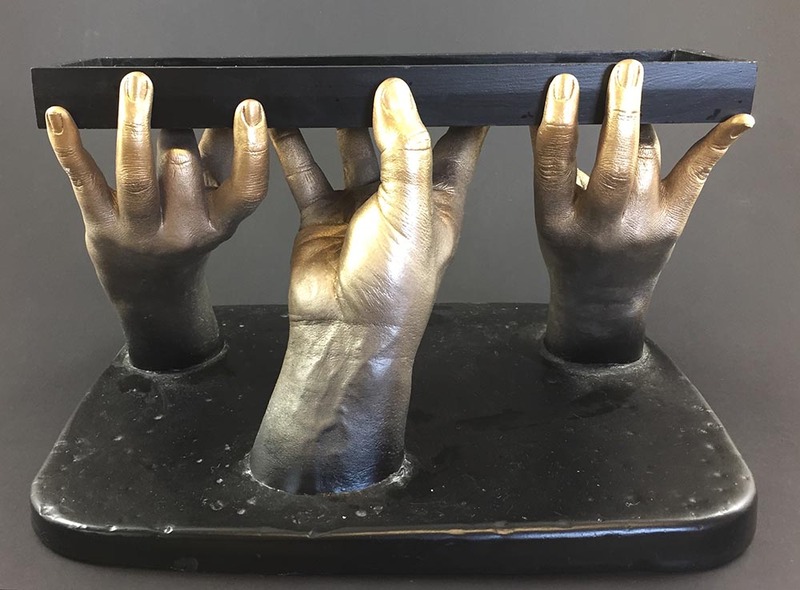 If an object is held in the hand during an alginate hand casting and the object is left behind in the mold when the hand is removed, the casting of the hand will be holding the object in exactly the same way the model's hand was. Some objects are easy to do, some are more complicated and some are almost impossible. Easy objects include smooth, non-porous ones. For example, a glass or plastic ball would be easy because there's nowhere for the alginate to stick or get stuck. Clean up on these castings goes very quickly. Slightly more complicated objects include highly textured objects with lots of nooks and crannies. All those little detail areas need to be cleaned out during clean up. We sell a LifeCasting Toolkit that contains a variety of tools that can make this much easier. A baseball has lots of little holes and stitching all the way around. Alginate and/or casting stone can get into these holes and it will require more clean up time. Very difficult objects include those that are made of cloth. Alginate just loves to get down into the weave of the cloth and when it sets, it becomes very difficult to remove. Objects like this CAN be coated in a water based hair cream type product and then washed off after the casting is removed from the mold. Like I said- more difficult. Some people like to do castings of their hand holding their dog's paw. Coating the dog's fur and the pads of their feet with a water based cream makes this type of mold/casting possible. Impossible objects would include those that would be damaged by getting wet. Alginate is just full of water and can cause problems with objects painted with water soluble inks or paints. Paper objects rarely look the same after being dunked in alginate. When in doubt, run a test with an object before committing to a full scale casting. Certainly you can go ahead and just hang on to an object, encircling it with your fingers. 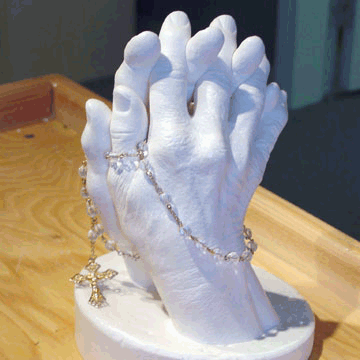 In these cases, the object will be permanently "attached" to the hand casting. Many objects can be held in such a way that they can be removed from the casting. As an example, if you hold a ball so your fingers do not come more than half way around the ball, then you will be able to simply lift the ball up and off the casting. Holding a conical vase by the tapered end will allow the vase to be removed from the casting's fingers as well. The main reason to make the object removable is to make the clean up and painting process easier. We did a casting once in which three hands held a wooden box down against the bottom of the molding bucket. The fingers were pushing the box down but did not come up and over the top edge. After removing from the mold, the box easily lifted out of the fingertips. We were able to paint both the hands and the box and then reassemble the whole thing. In our Finger Casting Kit, we encourage people to hold a thin piece of plastic between their thumb and fingers. Removing the plastic from the casting leaves a thin space that can hold a business card or a photo. For most of these, I would go with our HandGel (570) or BucketGel (390) formulas. For children, I'd go with our BabyGel (380) formula. You really want one of our alginates that mix up thinnish and has plenty of working time. Be sure to make your pose in the bucket so the object will display correctly in the finished casting. If you want the object facing upward in the casting make sure that the wrist is straight or bending backward when in the bucket. If you bend the wrist toward the palm, the object will end up under the hand and usually not as attractive.